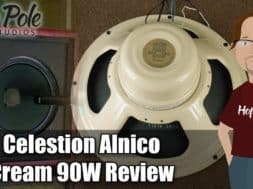 Home gear review Celestion Alnico Cream Review – 90W classic – Not so Vintage after all! Celestion Alnico Cream Review – 90W classic – Not so Vintage after all! Today we’re talking about the new Alnico Cream speaker from Celestion – how it’s a lot like the original Alnico Blue, with a much more modern hint of tone in there as well thanks to its 90W power handling. Check out http://www.hoppolestudio.co.uk for info on Mixing and mastering, tuition and band recording. Thanks to Remy, Valorware, Peter and Kerry.